Describe how the attributes of precast concrete create energy and operational efficiency for buildings while aiding in risk reduction. Discuss how a resilient structure not only encompasses durability and long service life but also ensures functional resilience and multihazard protection. Define precast concrete’s versatility in regard to both design selections and special concerns, such as historic preservation, reuse, and storm resistance. Explain how cutting-edge innovations like three-dimensional printing are reducing costs and increasing the versatility of precast concrete in buildings, bringing the life and safety attributes of concrete to a greater span of construction types. The Cortex Innovation Community is home to a vibrant 200-acre innovation hub and technology district in the historic Central West End of St. Louis. When the owners decided to build an additional mixed-use structure that could act as a gateway to the hub, they wanted to create a building that would measure up to the nationally ranked universities and medical centers in the surrounding neighborhood while achieving pedestrian scale to invigorate a walkable community. Contemporary precast concrete consists of a mixture of cement, water, aggregate, and optional admixtures that is cast off-site into specific shapes in a controlled environment. The concrete is poured into a form, or mold, and cured before being stripped from the form. These components are then transported to the construction site for erection into place. Precast concrete is reinforced with either conventional reinforcing bars, strands of high-tensile-strength steel, or a combination of both. Prestressing is a method of reinforcement where the steel strands are pretensioned in the form before the concrete is cast. The compressive force created by the strands allows precast elements to span greater distances and carry more load. Prestressing also reduces cracks since the members are in compression. While modern methods and techniques have enhanced aesthetic and performance capabilities, they have also preserved concrete’s original attributes. Precast concrete is an environmentally sound material produced from natural materials. No toxic substances are used or created by its production or use. Controlled manufacturing further enhances environmental soundness by optimizing material use, reducing waste when the panels are made and associated waste on the job site. Once in place, concrete’s resilience and performance shine. 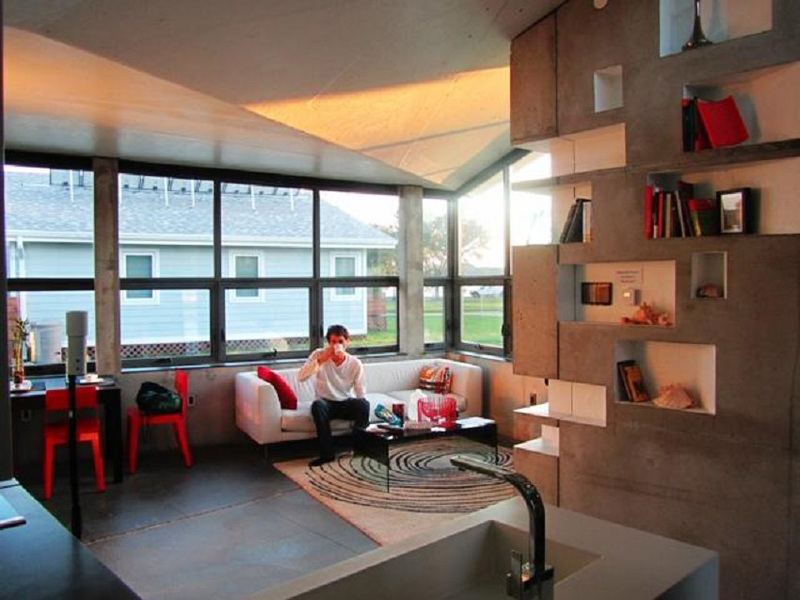 The thermal mass of concrete saves energy year-round. Precast concrete is noncombustible with inherent fire-resistant capability, creating a safe envelope that helps protect personnel, equipment, and the integrity of the structure itself. When used for structural components, precast also eliminates the need and cost of additional fire-proofing measures. Concrete’s high albedo, or ratio of light reflected, has the added quality of reflecting solar heat as well as sunlight, reducing the heat island effect and higher temperatures endemic to urban areas. The resulting lower overall temperatures can make a difference in the amount of electricity consumed in air-conditioning and reduce smog formation, potentially improving air quality in urban areas. In addition, the inherent sound attenuation properties, due to precast concrete’s mass, provide an economical acoustical barrier to exterior or interior noise penetration. The life-safety and tenant benefits provide a potent marketing asset when attracting long-term occupants. When a building needs extensive remodeling, precast wall panels can be reused and adapted for expansion or new design. 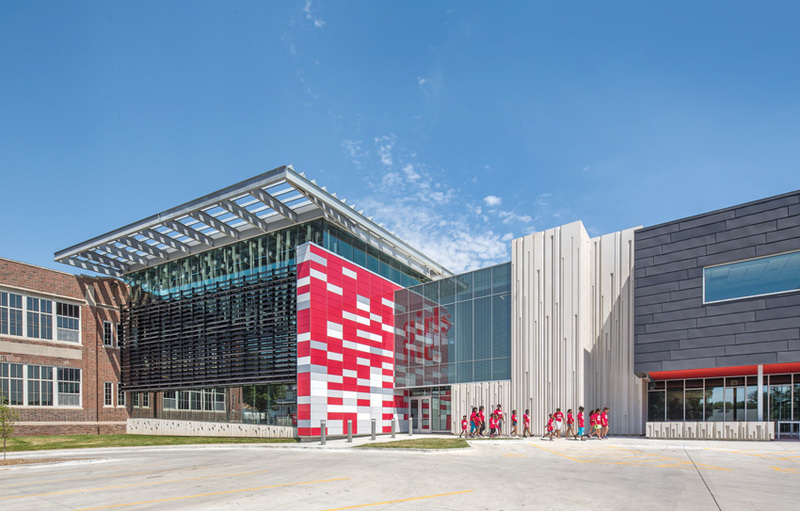 Owners of the newly expanded Girls Inc. health and wellness facility in Omaha, Nebraska, wanted a design to reflect their mission of being “strong, smart, and bold.” From the beginning, the architect felt the project’s scale, durability, and budget requirements made insulated architectural precast concrete wall panels the obvious choice. The enclosure provides an R-value nearly double what is required by building codes, while the exposed interior wythe of the panel matches the white exterior, eliminating the cost and continual maintenance of painting. Durability and adaptability: Precast concrete panels provide a long service life due to their durable, low-maintenance surfaces. Insulated sandwich panels paired with precast concrete construction also provide the opportunity to move and reuse panels to refurbish the building, rather than tear it down and discard it, should its use or function change. Thermal mass and energy performance: The thermal mass of concrete allows shifting of peak heating and cooling loads in a structure to help reduce mechanical system requirements and energy consumption throughout the building. Fire and natural disaster resistance: Concrete is noncombustible and can contain a fire. As a separation wall, precast concrete helps prevent fire from spreading throughout a building or jumping from building to building. Precast concrete also is resistant to wind, hurricanes, and floods and impacts from wind-driven and flood debris. Air infiltration: Precast concrete panels have negligible air infiltration. Minimizing air infiltration between panels and at floors and ceilings will provide a building with low air infiltration. These effects will lower energy costs and help prevent moisture problems. Abundant, local materials:Concrete is used in almost every country of the world as a basic building material. Aggregates, about 85 percent of concrete content, are generally low-energy, local, naturally occurring sand and stone. Most precast concrete plants are located within 200 miles of a building site. Using local materials reduces the transportation required to ship heavy building materials and its associated energy and emissions. Indoor environmental quality: Concrete contains low to negligible volatile organic compounds (VOCs). Polished concrete floors do not require carpeting. Exposed concrete walls do not require finishing materials, eliminating particulates from sanding drywall taped seams. Inedibility: Vermin and insects cannot destroy concrete because it is pest resistant. Versatility in use and design: Precast concrete insulated wall panels can be used in both load-bearing and non-load-bearing building applications. The use of precast concrete insulated wall panels for both building envelope and interior applications provides a variety of benefits for architects, owners, and consumers, including resilient designs that are energy efficient and attractive. Precast concrete insulated wall panels can be finished with a wide variety of textures, colors, and even graphic designs. Architectural precast concrete not only can ensure these general goals are met, but it also provides a myriad of life-cycle and ancillary benefits that are difficult to match with other materials. Understanding the benefits of precast concrete can assist designers in evaluating the impact of precast concrete on the environment and building operation. However, misperceptions about concrete’s cost, weight, difficulties with on-site erection, and connections, as well as the lack of aesthetical versatility of the product, often eliminate concrete from the picture. 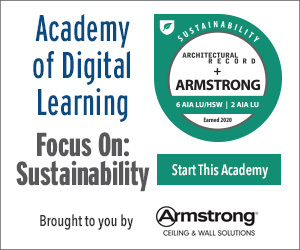 In particular, outdated and inaccurate perceptions of insulated concrete wall panels—that they are too heavy, not versatile, or do not do much to support sustainability of a structure—mean failure to consider a pioneering set of envelope technologies. Despite being a building block of some of civilization’s earliest structures, concrete has continued to evolve, and today’s products are anything but ancient. The precast concrete industry is heavily invested in research and development, with current investigative projects touching on everything from 100-year lifespan impacts on individual concrete components to aesthetic finishes, anchorages, and connections and interactions with wind-energy systems. 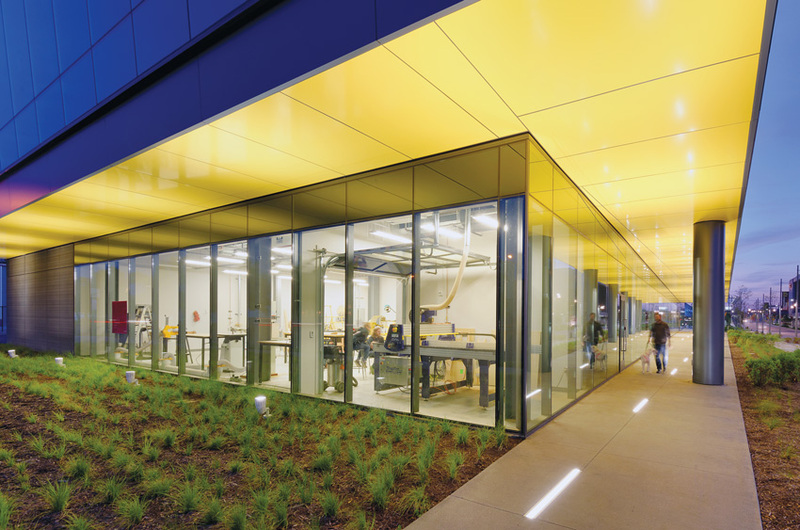 Performance does not only encompass simple energy conservation, but, as an asset, a material’s performance also must support whole building and occupant health. Manufacturers of precast concrete systems strive to produce products that solve the needs of architects looking for versatile and energy-efficient load-bearing and non-load-bearing wall systems. Precast concrete manufacturers produce insulated wall panels that can be used as both structural and non-structural components of a building system. To obtain a range of insulating, or R-values, precast concrete walls may have insulation applied to the back, or the insulation may be incorporated into a sandwich wall panel to reduce heating and cooling costs. The thermal mass inertia of concrete, which is recognized in ASHRAE standards, also reduces peak heating and cooling loads, saving energy year-round by reducing large internal temperature swings. 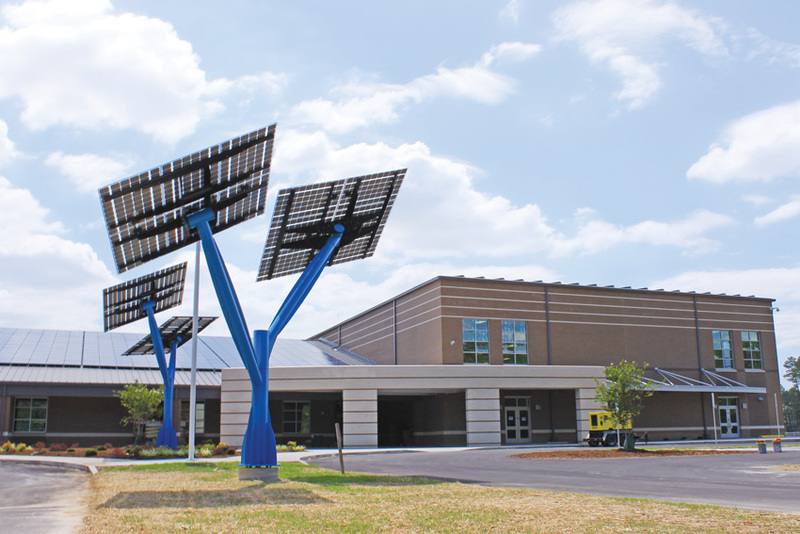 Constructed with precast concrete, Sandy Grove Middle School in Hoke County, North Carolina, features rooftop solar panels and solar trees along with several other energy-efficient systems. Anytime you start a project, you should stand back and look at the big picture goals, says Robbie Ferris, CEO of SfL+a Architects and Firstfloor. Upon completion of a project, clients and project teams too often lament the unrequited desire to try out a geothermal heating, ventilation, and air-conditioning (HVAC) system, or solar panels, that were scrapped in the face of budgetary constraints. The problem is that without big-picture goals, design and implementation are less likely to take into account how these decisions would impact other building systems. Whole-building analysis is about selecting systems based on the big-picture goals for the project and the qualities you are looking for, notes Ferris, and then optimizing how one system impacts the other. In 2009, SfL+a Architects began the design of Sandy Grove Middle School in Hoke County, North Carolina. As the recession set in, the district reviewed its projected total cost of ownership, estimating the debt service payment combined with the electrical bill to be $1.5 million per year. The project went on hold. In 2011, the district came back to SfL+a and said it desperately needed the new facility but could only afford $450,000 per year for the first eight to 10 years. Setting the lease payment at what the district could afford was the defining moment in the life-cycle cost analysis (LCCA) process. Precast concrete was selected for the structure. The team divided the total cost of ownership into categories: capital cost, interest cost, electricity and other utilities, and tax credits and incentives. Maintenance costs were determined to be about the same regardless of the systems selected, so the group focused on the elements that had the biggest impact. Electrical costs made up almost 30 percent of the total cost of ownership over the 40-year life expectancy of the systems. Knowing that we needed to generate 30 percent more electricity than we would consume, Ferris states, we factored in the number of solar panels we could install on the roof and their subsequent energy production, and we determined that the building needed to achieve an energy use intensity (EUI) of approximately 20 kBtu/square foot/year. This EUI goal led the project team to select the most efficient systems that it could find, including a geothermal HVAC system, LED lighting, a super-insulated roof, foam insulation in the cavity wall, and a variety of other energy-conserving measures. Additional savings came from tax credits that were available for the project, which made it a win-win for everyone. Over 40 years, Sandy Grove Middle School will save Hoke County Schools $37.2 million. Separately, when time rises to the top as the biggest concern, Ferris advises focusing on what can be prefabricated and then analyzing remaining systems. A combined architectural team of SfL+a, Stantec, and Mozingo + Wallace designed five new schools for Horry County, South Carolina, that had a tight 20-month design-permit-build schedule. To meet the schedule, the group chose to prefabricate the HVAC penthouse and use precast concrete for the roof and floor structures. These schedule-driven choices along with the program requirement to generate more electricity than consumed drove most of the system decisions in the building. A team of architecture and engineering students from the New Jersey Institute of Technology (NJIT) and Rutgers University entered the eNJoy House, Washington, D.C., in the 2013 Solar Decatholon, where collegiate teams design, build, and operate solar-powered houses that are cost-effective, energy efficient, and attractive. To meet the criteria for the decathlon, the house had to be solar powered and no more than 1,000 sqaure feet. The team chose a precast concrete home because it is low maintenance and durable; it can resist weather, chemicals, and moisture; it can contain natural materials and recycled byproducts to reduce its carbon footprint; and it has low to negligible levels of VOCs, making it a healthier alternative to standard construction. To meet aesthetic and energy goals, the precast concrete roof was designed in a bowl shape and calibrated for optimal sun angle and rain collection while hiding the photovoltaics and solar collectors.